The Om syllable is most often associated, in Western culture, with peace and meditation. We’ve represented it as a sew-on patch stitched in green on light brown cotton canvas, and measures approximately 3″ in diameter. Everybody knows that there are three main characters on Supernatural — Sam, Dean…and Baby. Show your love for that ’67 Impala by stitching her license plate onto your favorite bag or jacket! 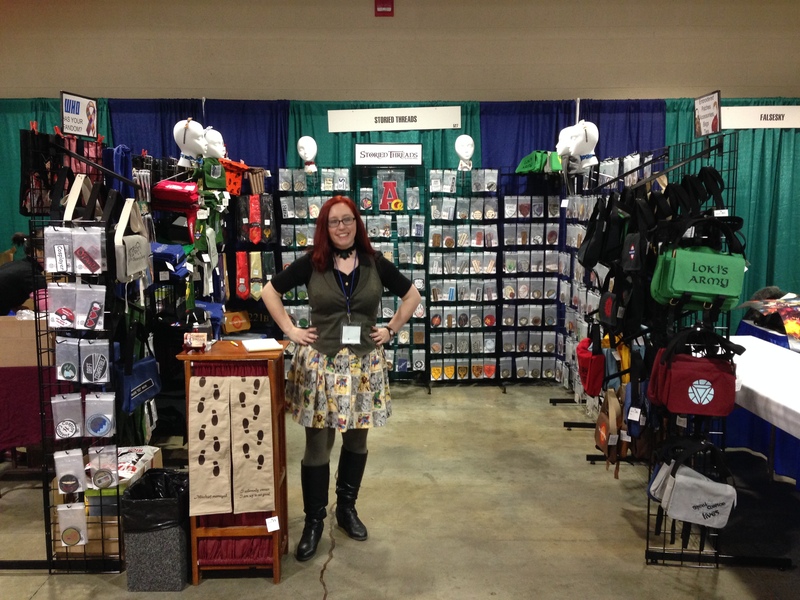 Last weekend was our first time vending at Anime Boston, and boy, am I happy we added this show to our schedule! I’d gone into 2014 looking at the big void in my show schedule between Arisia in January and the Connecticut Renaissance Faire in May, wondering how I might fill it, and even when the prospect of working Anime Boston popped up, I initially rejected it. I thought my stuff wouldn’t do well at an anime convention, but some friends of mine who attend regularly urged me to give it a shot. I’m glad I did, not only for the boost to my sales figures, but for the exposure. A lot of people who had never heard of me before now know the name Storied Threads, and could become repeat customers at my online shops. Gaining exposure to new customers, I’ve learned, is a tricky thing. I used to rely heavily on Facebook, but the site’s annoying algorithms aren’t terribly business-friendly. Nearly 4,000 people have liked the ST Facebook page, yet a typical post reaches only a couple hundred people or so (fewer if I add a link to a new product in the post; strangely, I get more views if I add the link in the comments section). Obviously, Facebook wants my advertising money, but past experiences have shown me the investment does not pay off. Twitter gives me guaranteed exposure in that my tweets will appear on the feeds of every person who follows me, but Twitter posts blow by so fast that unless someone has set their feed to alert them when I post, chances are anything I put up will get buried fast. Tumblr and Pinterest give me the benefit of guaranteed exposure for my posts, and they’re less likely to get buried in someone’s feed, plus those posts are both searchable and re-postable, which gives my entries some longevity. The problem there, as with all my social media outlets, is that I have no idea if any of them are driving business my way. I recently invested in some search engine optimization assistance, and that campaign just got underway, so it’s too early to tell whether it’ll improve my visibility, but I’m hopeful it’ll get the Storied Threads name out there.